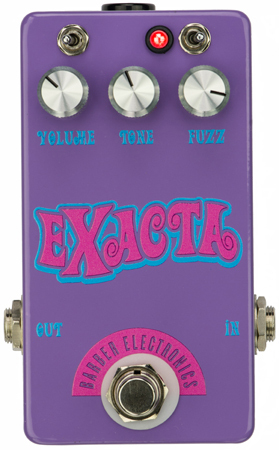 Introducing the Barber Exacta fuzz! The Barber Exacta dials in trippy fuzz perfection. Now there is a vintage fuzz that is not picky about placement in the signal chain, and works fantastically with humbuckers and single coil pickups! We include two toggle switches to allow 2 classic fuzz circuits, which include the Triangle fuzz and Jumbo Tonebender sounds, along with an extra sweet flattened-mids version of the Triangle fuzz sound, then there's the Sludge-switch which selects perfect girth for single coil, bridge humbucker and neck humbucker...who knew? Crazy sustain, enhanced EQ, sweeter than 10 packets of sugar in your morning coffee, and Barber's unmatched build quality and service. Made in the USA. Available now! Special order black knob RAM version for $109.95!